For fleet professionals seeking to earn the industry’s top designations of excellence, the Certified Automotive Fleet Specialist (CAFS) and Certified Automotive Fleet Manager (CAFM) certifications, NAFA Fleet Management Association has developed a concept to help compress the process of obtaining these marks – while also having full access to NAFA’s vast Institute & Expo fleet event. 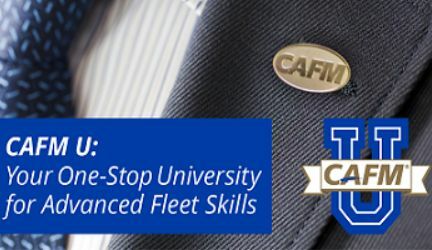 NAFA’s CAFM U, a fleet-focused “university-style” style event, will be held April 13 through 18, 2019, in conjunction with NAFA’s Institute & Expo, in Louisville, Ky. This concentrated opportunity lets attendees learn and take certification exams – twice – to increase chances to either start or complete the process toward earning CAFM or CAFS. CAFM U also offers another key advantage – it also lets “students” attend all the I&E sessions, networking events, keynote talks, and the large I&E expo floor at no additional cost. Not only can CAFM U students return to the office with new solutions and ideas to save them and their organizations time and money, but they also have the chance to complete their CAFM or CAFS certifications, depending on where they are in the process. A new year means new opportunities, so fleet managers, fresh from year-end reviews, have new goals at work. In fact, there’s always an incentive to increase their earning potential – Monster.com recently rated CAFM as one of its top 10 certifications for salary growth, stating CAFM holders earn an average of 27 percent more than those without this certification. CAFM U offers fleet professionals advanced education in the field’s primary disciplines: Asset Management, Business Management, Financial Management, Information Management, Maintenance Management, Professional Development, Risk Management, and Vehicle Fuel Management. Passing any four of these eight exams will earn a student their CAFS certification while completing all eight will earn the CAFM certification. This event – an evolution of NAFA’s past boot camps at I&E – was the result of feedback from current and past CAFM students, who wanted an all-inclusive study and testing solution, combining deep-dive fleet instruction with ample opportunities to test on the information they have learned. Additionally, students who do best have spent time in advance studying the materials required to pass the course exams, as CAFM and CAFS does takes time and commitment. Students who register for CAFM U will be able to take their certification tests on Saturday, April 13, enabling them to see which exams they passed, and which subjects they still need to focus on. Throughout the week, they can attend focused sessions and boot camp classes for the fleet discipline tests they did not pass or can take the exams for the first time. They can then retest on Wednesday, April 17 and/or Thursday, April 18, at no extra cost, on the modules needed to complete the fleet discipline subject area. Because CAFM U runs in tandem with I&E, attendees will have access to all that the conference has to offer including forward-thinking presentations and unparalleled networking. Students will be able to return to the office with real solutions that save their organizations time and money. They potentially can return as CAFS- or CAFM-certified as well! NAFA’s CAFM U offers fleet managers unmatched value, as well as a unique, inclusive opportunity to learn and advance their careers. Learn more about this event and act now at www.nafainstitute.org.